How Healthy are Paw-Paw/Papaya Leaves? HomeDIETHow Healthy are Paw-Paw/Papaya Leaves? Most of you are familiar about the health benefits of papaya fruit. But, not many know about the amazing health benefits of papaya Leaves. Papaya Leaves contain powerful health benefits and healing compounds that are very important for great health and vitality. Below are the health benefits that you could get, if you maximize the use of papaya leaves. Papaya leaves are very beneficial as cleansing agent, most especially if you make the papaya leaves as a juice. This is due to the compound called karpain that is present in papaya leaves. Karpain prevents the growth of microorganism and other toxins from your body, therefore, it will make your skin healthier. Papaya leaf can be used in hair treatment. Papaya leaves bring great benefits for your hair , most especially when you make these leaves as a juice, and mix it up with honey or coconut milk. The book Healing Food shows that papaya contains enzymes such as papain and chymonpapain. Both of these have been shown to help in digestion, clean the colon and prevent constipation. Also, papain is helpful in healing and preventing stomach ulcers. Papaya leaves are also rich in amylase and protease. These enzymes help break down carbs, proteins and minerals which helps in digestion. Its high anti-inflammatory properties also help reduce colon and stomach inflammation. Some women experience menstrual pain during their period. One way to reduce menstrual pain is to use papaya leaves, simmer it and boil it. 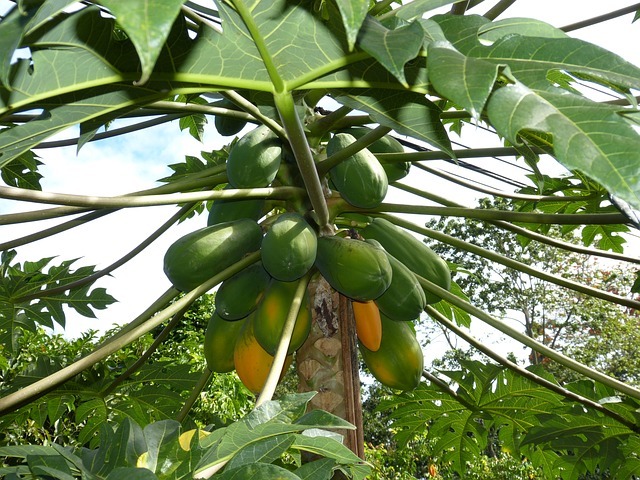 Papaya leaves contains much more Vitamin A and Vitamin C as compared to the fruit. This high content of Vitamin c means that papaya leaves releases antioxidant which will fight against free radicals. This antioxidant is very beneficial to prevent your skin from any skin disease such as acne and heavy pigmentation. The components in papaya leaves can help inhibit the cellular growth of tumors, and may cut off the blood supply to these types of cells. Evidence has proven that the juice from the leaves can interfere with the growth of tumors and prevent abnormal cell growth. Also, clinical trials are underway which study the use of papaya leaves extract with those undergoing chemotherapy, to enhance the cancer fighting properties. Use about 3-5 medium-to-large leaves and 2 liters of water. Boil the leaves using the water, until it is reduced to about half the quantity. Leave it to cool, then discard the leaves and consume in small doses as needed.